Most coaches would like their hitters to have better technique so that they could produce more power. Most coaches would like to reduce the chance of shoulder injuries in their hitters. In this post, Stanford coach Kevin Hambly shares some arm swing progressions to help your hitters. In the clips below Coach Hambly shares three sequences that he uses to teach the attack. In the first video the players begin by throwing the ball up to themselves by swinging both arms like they were jumping to attack. They will toss the ball up and get their right arm back in a compact position (elbow back and up around the shoulder; not extended up). The left arm should be up in front and extended. As the the player gets their arms in position, they should open their shoulders and hips. The players will then rotate 180-degrees as they strike the ball. In the second video, Coach Hambly has the players start behind the 10 foot line with a tennis ball in hand. They will then run to the line and take their approach. The athletes should open their hips and shoulders, being sure to lead with the hip and get the shoulder back creating a stretch in the torso. The right arm should be in a compact position and the left arm should be up. The players will throw the ball across the net and rotate as the they throw. In the third and final video, coach Hembly has the players start behind the 10-foot line and toss the ball to setter and follow to the net for an attack. The hitter will focus getting the necessary torque (turn 180-degree). She must lead with the hip and get the shoulder to back just as in the previous drill. He begins by having the hitter hit down the middle and then progresses to hitting angles. In each case it is important that the rotate their hip and point them in the direction that the ball is to go. 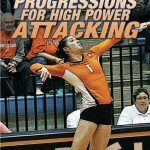 These drills were taken from Coach Hambly’s DVD entitled Arm Swing Progressions for High Power Attacking for more information about that DVD you can click the link above. Here is the link to Coach Hambly’s instructional DVD again if you are interested in learning more. Just click the image.